Sure, you've heard of the Louvre, the Pompidou, and the Musée d'Orsay. You know about the Picasso Museum and l'Orangerie. But what about the Musée du Parfum Fragonard? The Musée de la Chasse et de la Nature? The Musée Montmartre? Musée Gustave Moreau? There are dozens of small, niche museums around Paris (and hundreds around France. 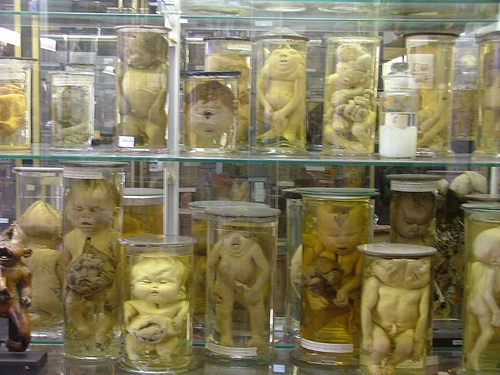 Ever heard of the Musée de la Poire Tapée -- the Museum of the Smashed Pear? I've been there, too). The Musée du Parfum Fragonard on the Square de l'Opéra Louis-Jouvet is new, but joins a previous-and-still-open version of the museum on neighboring Rue Scribe, both in the 9th arrondissement, just next to the Palais Garnier. Besides all things perfume, the museum is also interesting because the building itself used to be a theater, a velodrome (so ladies could learn to bike ride without being seen in public, because it was too scandalous to show their legs), and a furniture/house décor store. Musée du Parfum Fragonard has no entrance fee, so you will not be surprised to hear that there's a significant (and very tempting) museum gift shop at the end. But even the gift shop is education; you get to sniff and test everything. Your nose will get overworked, but you'll certainly learn a lot about how fragrance is made and what you do -- and don't -- like. The Musée de la Chasse et de la Nature is also housed in a gorgeous building -- an old Marais mansion. It's a theme with these small museums and a great use for glorious old buildings too big and expensive to serve, in modern times, as private Paris residences. There are, obviously, a lot of dead, stuffed animals. Most of them are in fairly traditional poses, though, like a glow-in-the-dark painting on velvet, there's also a troop of baboons inexplicably smoking cigars and playing poker. This museum gift shop tempts me less, though I am slightly intrigued, amused, and simultaneously revolted by the title of one of the books they're selling: Voulez-vous Manger Bambi? (Do You Want to Eat Bambi?). 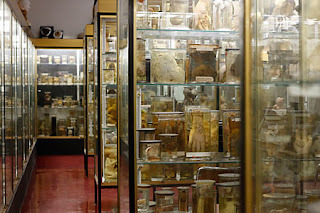 And speaking of gruesome displays and revulsion in general, the Musée Dupuytren, part of the Sorbonne University collection, officially closed its doors just last week. 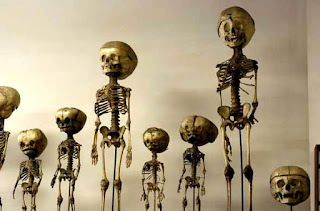 I wanted to sneak in a visit to this museum of medical curiosities and specimens in its last days, and apparently I wasn't the only one with the idea. There was over a two hour line, for only a two hour visiting window, so all I got to see was the outside of the building, which is charming, and an unusual statue you'd expect to see only at a medical college. Or a Halloween party. These are some photos taken from the internet of what I would have seen, and what I will be able to see once more when the specimens are at their new home -- on the Jussieu campus even closer to my apartment -- starting in September. If you Google it, you'll see a lot more gruesome images than this, but I just couldn't bring myself to re-post them (yet). I know people who've stayed in Paris for a month nearly year who've never heard of the Musée de Montmartre et Jardins Renoir. Heck, I have two older Parisian friends who just "discovered" the museum themselves a couple weeks ago, though it's been here since 1960 in the oldest building in Montmartre. It's located in the shadow of Sacré Coeur on one of the most charming streets in Paris. The museum itself is very green, as the garden is what it's most famous for. 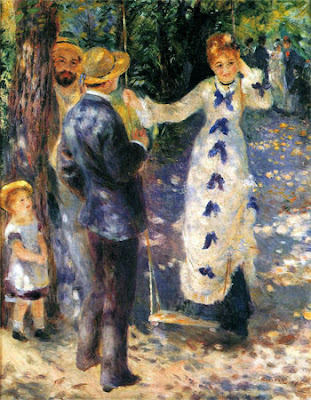 And that's because the most famous former resident of this house, Pierre-August Renoir, painted one of his most famous paintings, The Swing, just outside in the garden. You can tell the garden is more developed than in Renoir's time. Even though the wooden swing is still there, and so are some of the trees in the background, it doesn't look quite as much like a natural forest as it used to. Or maybe it never did, and that was just artistic license. One has to assume that they've anchored the swing to the ground because too many people were falling off trying to replicate the pose. In the back of the garden is the only still-functioning, still-existing vineyard inside Paris' city limits. Of course, Montmartre used to be outside of city limits, which is why it was relatively cheap for artists to come out and live and paint here. Not true anymore, of course. The museum is dedicated to explaining the little neighborhood of Montmartre, the artists who lived and painted here in the house, and also the heyday of local history -- Le Chat Noir cabaret bar, Toulouse-Lautrec, le Moulin Rouge, and the Cancan. There's more art, and a fabulous staircase, at the Musée Gustave Moreau. At the Musée des Arts et Metiers, like at so many other Parisian museums, it's not just what's inside the museum that's impressive. The buildings are often just as special as what they contain. This museum is housed in the Royal Priory, mostly built in the 12th century. Even at the famous Louvre, inside the King's former palace, you can find yourself off the trodden path. The Petite Galerie offers more unusual temporary exhibits, such as this one which translates as "Myth Founders: From Hercules to Darth Vader". And let's not forget the Japanese Tanuki. I would point out he looks so out of place on the poster, but frankly he doesn't look any more out of place at the Louvre than "Dark Vador". It's simply not possible to see all the little museums in Paris, or even everything at all the big ones, for that matter. 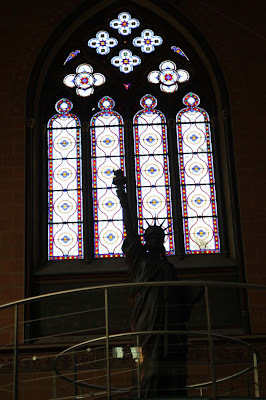 This is far from an exhaustive list of what's out there in Paris -- what about le Musée Baccarat, le Musée de la Vie Romantique, le Musée d'Edith Piaf, the Museum of Man, the Victor Hugo House, the Le Musée de l'Erotisme, or any one of dozens of other small museums? -- but it's already pretty close to an exhausting one. It's good to know for locals and repeat visitors alike: there's more here than just what's in your guide-book. Buchette du Gois is an artisanal raw goats' milk cheese from the Loire-Atlantique. In fact, it's not made in the Gois (or more accurately, on the Gois), as the Gois is a passageway that connects a small island to the French mainland. The passageway would be a terrible place to raise your goats or make your cheese, as it gets submerged under the Atlantic during high tides. You need to time your drive across it carefully. And graze your goats elsewhere (unless they're good swimmers). It's a really rustic cheese not just made locally in the Vendée but also sold locally in the Vendée. I find it in the gourmet cheese section of the local grocery store on a trip to the coast, and I've never seen it sold in Paris or anywhere else. That's too bad, because it's a really enjoyable -- and beautiful -- cheese. I love the gorgeous, rusty, blue-gray variegations on the crust (as well as on the old bench where I placed the plate). Buchette du Gois is a thick, solid, little log ("buchette") that's on the verge of crumbly. There's a distinct yogurt-y tang to it, with strong salt and grassiness behind it. All in all, a very enjoyable cheese indeed, the look of which is almost sure to scare off cheese novices. Buchette du Gois is made at a small dairy farm, part of a group of small dairies proudly labeled on the cheese package as "Les Petites Laiteries". The museums I'm talking about here could be part of a group of "Les Petits Musées" if only somebody had thought to organize them into a consortium.